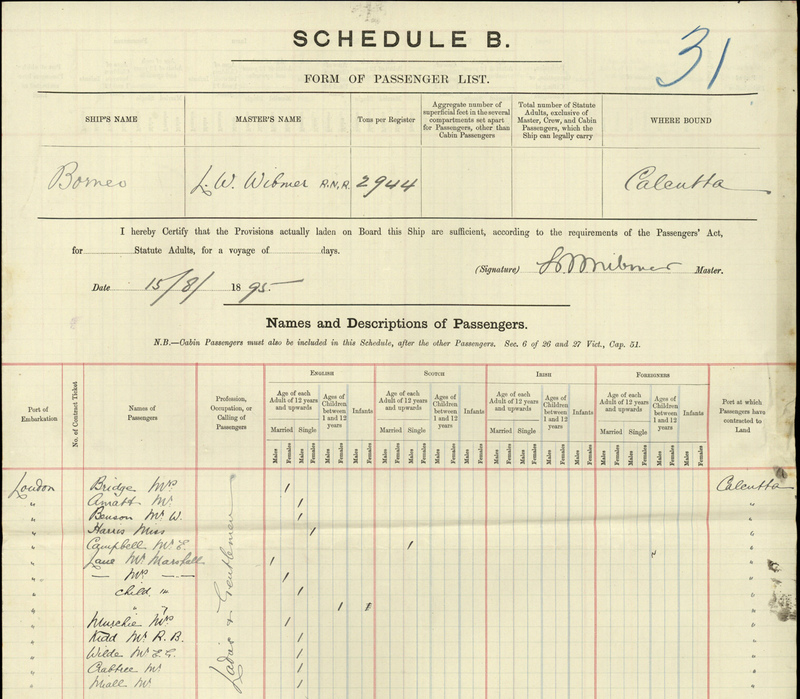 Passenger List from the 'Borneo', 1908, from London to Calcutta, with the Lane Family members. Marshall Lane enlistment paper with Tank Corps, 1918 - record strip shown in two parts. Marshall Lane was the older of the two sons of Marshall Lane (II) and Anne Elizabeth Lane (nee White). Tracing his life is difficult because he had the same name as his father, and it is clear that both spent periods in India, but not always at the same time. His grand-father was also named Marshall Lane. To avoid confusion, they are referred to as Marshall Lane (I), (II) and (III) on this website. Marshall Lane (III)’s birth was registered in the 4th quarter of 1887, in the Grantham district (probably in Bottesford), but other records show that he was baptised in Dumdum, Bengal, on the 29th October, 1887. These dates seem to indicate that he was born immediately before his parents set sail for India, and was baptised on arrival. They could refer to different individuals with the same unusual name and born at about the same time, but this seems rather unlikely. The records indicate that his life was marked by a complicated series of journeys to India and back. By 1891, the family had returned to England, and in the 1891 census, Marshall (II) and Annie Lane were living in West Street, Erith, Kent, with William White, Annie’s father, and Emily White, probably her sister. Marshall senior worked as a blacksmith. Florence was aged 10. Their son, Marshall Lane (III), was now 3 years old. However, they must have returned to India before 1898, when their second son Harry William Lane was born at Dumdum, Calcutta. There are no census records of Marshall Lane (III) from 1901 or 1911. His parents had sailed on the 15th August, 1895, on the ‘Borneo’ bound from London to Calcutta. 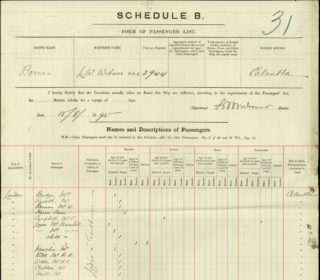 The passenger list indicates that they were accompanied by two children, aged 14 and 7, who must have been Florence and Marshall (III). They returned later, as can be deduced from a report in the Grantham Journal of the 10th September, 1904, which said that, at the Bottesford Angling Club dinner, Marshall Lane “delighted the company with his fine rendering of some well-known bass songs”. This must have been Marshall (II); Marshall junior would have only been 17 at the time. Then in 1908, Marshall Lane was present at ‘A Farewell Supper’ at the Granby Arms held to mark the departure of his brother Frank for Western Australia (Grantham Journal, 29th February, 1908). On this occasion, Marshall Lane (II) had been home on leave for a year, but was returning to Calcutta. It is not clear if his children were in Bottesford at this time, though it seems likely. It is also unclear whether they travel back to India with their parents. What is clear is that Florence Lane married Herbert William Daybell in 1913, as reported by the Grantham Journal 6th September 1913. The report stated that her brother, Marshall Lane (III), was best man, but their parents resided in India, where Mr Lane held “an important position under the Indian Government”, and were not present. Therefore, at this date, Marshall Lane (III) was certainly in England, whereas his parents were in India. Marshall Lane (III) enlisted with the Tank Corps, Service Number 35280 (rank unclear, but later he was a ‘fitter and turner’), on the 1st June, 1918, at Whitehall, stating that he had been born in Grantham, son of Marshall Lane (II), and that his home address was West Dale, Belvoir Road, Bottesford. He had been an engineer in India, and had also served for 1 year 272 days with Service Number 2160, in the 1st King Edward’s Horse, also known as the 2nd Dragoon Guards. Thus, it appears that he joined the army in India late in 1916, having travelled there and started working as an engineer (after he had been best man at his sister’s wedding in 1913). Additions to the attestation record indicate that he was discharged from the Tank Corps on demobilisation on the 31st March, 1920, but then re-enlisted for a further two years with the Tank Corps, of which he actually served 1 year 8 months, leaving on the 17th November, 1921. 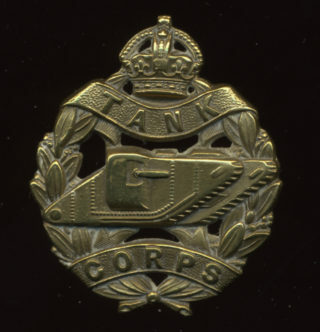 However, he immediately re-enlisted for a second time as a ‘fitter and turner’ with the Royal Tank Corps, giving his next-of-kin as his mother, Annie Lane, of Grantham Road, Bottesford. He finally left the army on the 16th November, 1923, at Hampton Court. In total, he had served from 1916 to 1923, first with the Dragoon Guards, then from June 1918 in the Tank Corps. No other details of his military service or the medals he was awarded have been found. Marshall Lane’s father, Marshall Lane (II), died on the 5th November, 1919, in Leicestershire, aged 59 (Grantham Journal, 13th November, 1919). Annie Lane died on the 23rd April, 1932, in Bottesford, aged 72. Marshall Lane (III) married Sybil A. Austin at Watford in 1923. They had a son, Anthony, who died on the 5th November, 1931. Electoral Records from 1925 to 1930 show that Marshall Lane (III) lived at Beulah House, Chorleywood, Herts, with his wife Sybil Ann and Sarah Ann Austin (probably his sister-in-law). In the 1939 Register, Marshall Lane, a married engineer born on the 29th October 1887, was on his own on the date of the register, still at Beulah House, Station Approach, Chorleywood, Hertfordshire. Sybil Lane died in 1956, aged 66. Marshall Lane died in 1958 in the Watford district, Herts, aged 71.